The babies started leaving the nest one at a time. The first one I saw was on 1/6/11. I left him out for a while but the parents were not paying him any attention so I put him back. Their nest is packed with all of them in there and that was always my concern so I will always have a big nest in the future. I put a shelf that my conure used under the nest then I put a kleenex box half filled with paper napkins on the shelf so incase someone got knocked out of the nest they woould have a soft landing and that is exactly what happened. There are 4 adult birds and 7 fledgings piled in that small wicker nest and lots of "poop". Four babies decided to leave the nest and landed in the kleenex box. On Sunday 1/9/11 3 were still in the dirty nest and the the other 4 were mostly in the box but the parents were feeding the ones in the nest and didn't want to go in the kleenex box, so I kept taking the 4 and putting them in the nest just to get fed. So on Sunday I put a millet spray in the kleenex box and the 4 adults went right in. I let them get familiar with the box for a few hours and then I put all the fledglings in the kleenex box and threw the nasty packed with poop nest away! All 4 adults are feeding all 7 fledglings. The Fledglings are 4 1/2 weeks old and still in the same cage as their parents plus the other 2 females that were in there. It looks like everyone is eating and drinking on their own, I still have a few that still beg. I will probably wait another week to put them in a bigger cage as I want to let them spend as much time with their parents to learn from them. I spend a lot of time making sure the seed cups and egg dish stays full and keeping the cage floor paper changed. Fledglings are fun to watch as they learn how to perch and how to make a good landing, mostly they end up missing the perch or land on one of their siblings. I can see why finch owners like to have their finches reproduce but also you can't keep them all so you do need to find good homes. I put them in the new cage which is 36" tall, I put the parents and the other two females in there also to make sure the babies stay with them for another week and the 2 orange cheeked wax bills. I will be taking a lot of them out as some of the fledglings are going to new homes of friends of the family. I still have 5 babies that are 20 days old in another cage. I just wanted to add that just because babies fledge doesn't mean that your worries are over. You still have to watch to make sure that they are all eating and drinking. When they drink make sure they are not just playing in the water but are actually drinking water. Also make sure parents are still doing feedings until you see the fledglings eating egg food and seed. 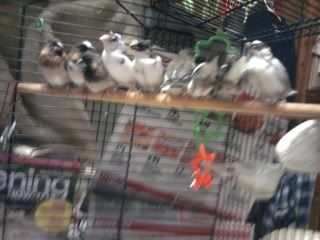 Mine will be 6 weeks old on Saturday 1/28/11, and are all eating and drinking and the parents don't feed them anymore. I made it thru my first clutch.